It's 2019, and popup ads are still a problem! We've tested over two dozen popup ad blockers. These 12 ad blockers offer the best quality and are completely free to use. Are you a part of the crowd that hates popup advertisements? Most people are. That’s why many websites have simply stopped using them as their primary means of paid advertising. Still, the bane of the 90s hasn’t exactly gone away, and many websites still inexplicably utilize popups. In some cases, however, website owners may not know that their sites are throwing out popups left and right. In the worst cases, those random popups may not be the result of poor advertisement planning, but a piece of malicious adware spawning popup advertisements on your machine. 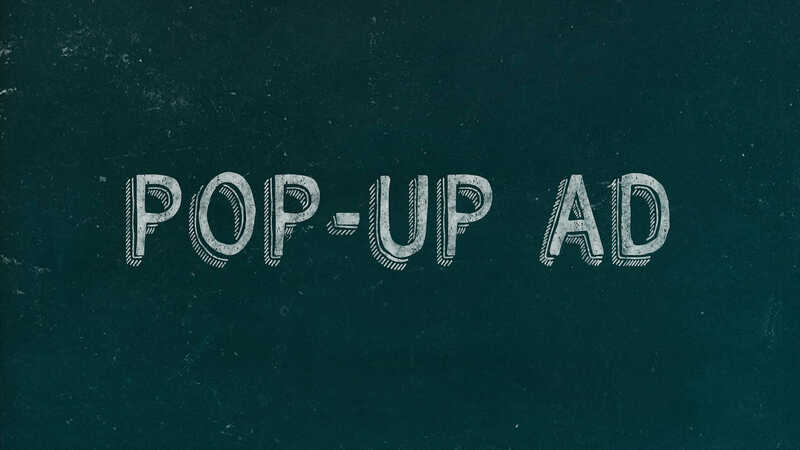 Putting an end to popup hell can be entirely satisfying — and surprisingly simple. There are a number of popup and adware blockers out there that will make sure your web browsing experience is as seamless (and less annoying) as possible. You’ll find different popup blockers available for every web browser, with many that cover all web browsers out there. Some of these popup blockers will also block regular on-page ads. Many are built into the web browser you’re already using and may just need to be turned on or have the settings tuned to work properly. Let’s explore more of these options in detail. We put a handful of popup and adware blockers to the test. Through our testing, we found that the built-in popup blockers on the most popular web browsers did the best job at blocking popups. Most do not include ad blocking features. However, if you do want a built-in popup and ad blocker, go with the Opera web browser. The browser is fast, runs with fewer resources than Chrome, and has a built-in VPN, something we certainly support at Comparitech. Popup and ad blocking are more important than just getting rid of the much-agreed-upon annoyance of such advertisements. Advertisements of all kinds can be a security risk. If you’re getting a lot of unwanted popups, it could mean that you have adware, a type of malware, installed on your system. You can get rid of this pretty easily. Our guide on removing malware and adware on Windows computers should help you clean up your system. Normal advertisements on many unsecured websites could also be a virus risk. Hackers can use advertisements to spread malware onto your system. This is not unheard of or uncommon, and it even happened to Yahoo in 2015, when a group of hackers hijacked advertisements on many of Yahoo’s main pages in an effort to spread malware. Consider a popup blocker an absolute necessity for your own security and your sanity. Be wary of considering “popup blocking” and “ad blocking” the same thing. They’re often used interchangeably, but many sites are feeling the painful pinch of adblockers. Popup blockers will block websites from sending out any form of popup, or stop adware from making popups appear. This can be anything that loads a popup, and not just advertisements. Some websites actually use popups for legitimate purposes, such as for logging into different areas of the website or for making payments. In those cases, you may want to whitelist some websites you normally frequent that utilize popups outside of advertisements but for good purposes. Indeed, ad blockers are putting a huge dent in free web content, the biggest unintended consequence of using them. This has given rise to more sites using affiliate links or referrals (something we do here at Comparitech on occasion), in order to help keep the proverbial lights on. When using ad blockers, consider the impact it may have on the websites you enjoy using for free. You may consider whitelisting some sites that you like, know and trust, that use advertising. Those advertisements still generate revenue for those websites, even if you don’t click on the advertisement. All popup blockers were tested using two different methods. The first was PopupTest.com. The website provides 17 separate tests for different popup methods. This includes 4 tests for good popups, which an effective popup blocker should not block. We excluded two of the tests, as it appears that those two pages were not producing any sample popups. The second method we utilized was with native ad test for on-page and popup ads produced on the websites http://animefushigi.co/latest-anime/ (6 on-page ads, 2 popups), and a good login popup from Bungie.net. A score based on additional features, such as whitelisting, on-page ad blocking and tracking cookie filtering (10 points for each additional feature, no maximum score). These scores are combined to create a final score for each popup blocker/ad blocker application. *Note: The built-in popup blockers mostly only work on popups, not on-page ads. The max score for these for “native popups” was 20, while the third-party applications designed to block all forms of ads had a max score of 90. You may have noticed that the PopupTest.com results were suspiciously similar for the web browser blockers and the third party blockers. When testing, we found that the built-in browser popup blockers seemed to block the test popups that we included, while the third-party applications and extensions all ignored them. The reason for this is due to a mixture of how the popups work, and how the built-in and third-party blockers work differently. We believe this is because the third-party ad blockers are mostly designed to actually block ads through IP or domain filtering. Meanwhile, the built-in popup blockers are primarily operating by closing down windows indiscriminately. With the exception of Opera, the built-in browser popup blockers are simply not intelligent, while the third-party blockers are designed to be more distinguishing, although there is variation based on whether you can or cannot adjust the settings. Google Chrome performed similarly to Firefox and Microsoft Edge. It passed all of the PopupTest.com samples we tried, including the good popups. It failed the native ad test from animefushigi.co/latest-anime/, failing to block the popups that spawned on the page (both timed). All ads, including an annoying popup at the bottom of the page, continued to show up. It passed the native good popup test from Bungie.net. You can add exceptions to Google’s popup blocker to add trusted URLs. The browser also includes a tracking cookie blocker. Based on all three tests, Google’s built-in popup blocker is good, but not exceptional. It fails to block real ads, although it won’t make the error of blocking the good ones. Firefox has a limited set of features on its built-in ad blocker. You can block popups and tracker cookies, with the additional feature of whitelisting websites through exceptions. Firefox passed the PopupTest.com samples, including the good popups. It failed to block the popups spawning on animefushigi, but allowed the good popup from Bungie.net. The built-in blocker on Firefox is as equally useful as the one on Google Chrome. It won’t block the popups you want, but it may not block the popups you don’t want. Although Microsoft now touts its Edge browser, it still includes IE on its newer operating systems. IE’s built-in popup blocker provides more options than all of the other browsers, allowing you to adjust the strength of your blocking (from only blocking from insecure websites to blocking all popups wholesale) and allowing you to add in exceptions. With the “high” blocking level set, IE performed similarly to the other web browsers, passing all of the PopupTest.com samples we tested, including allowing the good popups to open right up. On animefushigi, IE halfway blocked one popup ad (the box loaded without content) and failed to block the other popup. It did not block the on-page ads. Unfortunately, IE blocked the login popup from Bungie.net, a mark against it. Overall, IE’s built-in blocker tends more toward blocking the things you actually want to load, while failing at block the actual popups. Microsoft Edge performed similarly to Google Chrome and Firefox on the PopupTest.com samples. It blocked all of the tests we used from the site, while also successfully allowing all of the good popups. It surprisingly blocked one of the two popups that spawned on animefushigi, something Chrome, IE and Firefox were unable to do. A point against it occurred with the login popup test at Bungie.net. Edge allowed to window to come up but failed to load the content. Unfortunately, you can’t adjust the settings for the popup blocker on Edge. That includes the inability to add exceptions for different websites or adjust the strength of the blocker in any way. While it works marginally better than the other browsers at blocking popups, the lack of options and the blocking of good popups is not entirely positive. 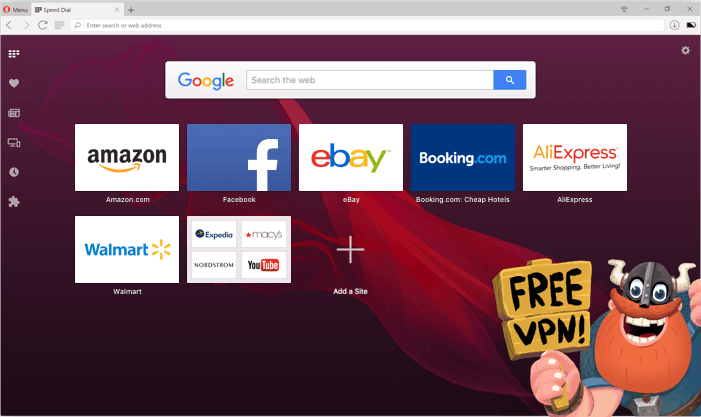 The Opera web browser offers a few privacy features beyond generic popup blocking. It’s designed to block on-page ads and includes a built-in VPN and a tracker cookie blocker. The browser passed all the PopupTest.com samples we utilized, including the good popup test. Opera is the only built-in ad blocker that actually blocked every ad on the animefushigi page, including the popups, and the only one that caused animefushigi to send me to their scolding anti-ad blocking page. Opera also allowed the good popup from Bungie.net to load right up. Taken with the other positive blocks, Opera essentially blew the other web browsers and even many of the third-party blockers, right out of the water with functionality. 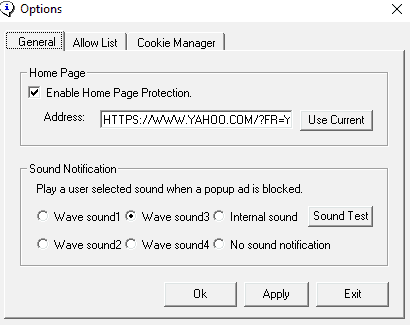 Particularly interesting was the fact that this built-in blocker appeared to be more discriminating than all of the other browsers on our list, capable of blocking the PopupTest.com samples, while still also allowing good popups and blocking the unsatisfactory ones through IP filtering. This one is truly a “best of both worlds”. Adblock performed impressively well under testing. While it failed the PopupTest.com samples (expected), with the exclusion of the good popups that it allowed through, it quickly passed the animefushigi test, blocking all of the ads on that page and prompting a redirect to the anti-ad blocking page. AdBlock also allowed the Bungie.net login popup to load without fail. 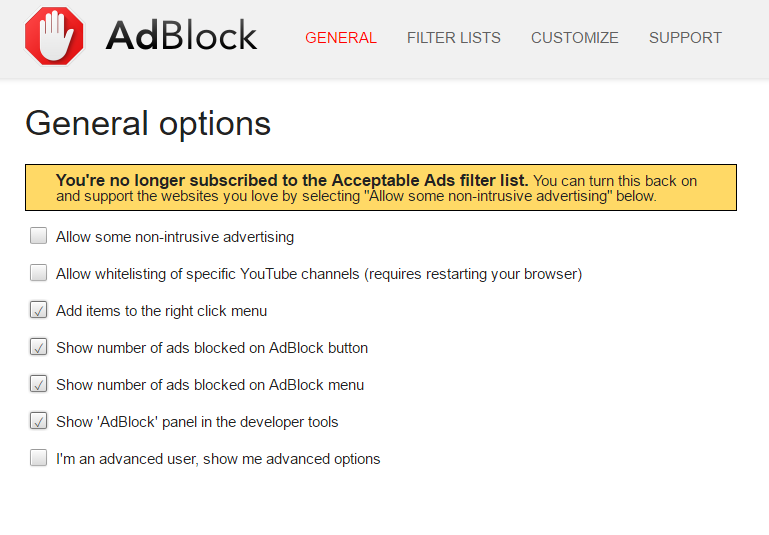 The true strength in AdBlock is just how customizable it is. You can change a large number of settings on this extension, including whitelisting, custom and preset filters, individualized blocking or allowing of ads through right-clicking, and whitelisting for specific youtube ads. AdBlock emerges as one of the best options on our list, particularly due to how many features are packed onto this now-free application. Although it’s only designed to work with Chrome, you can also get this application on Opera by downloading the Google Chrome Extension extension. 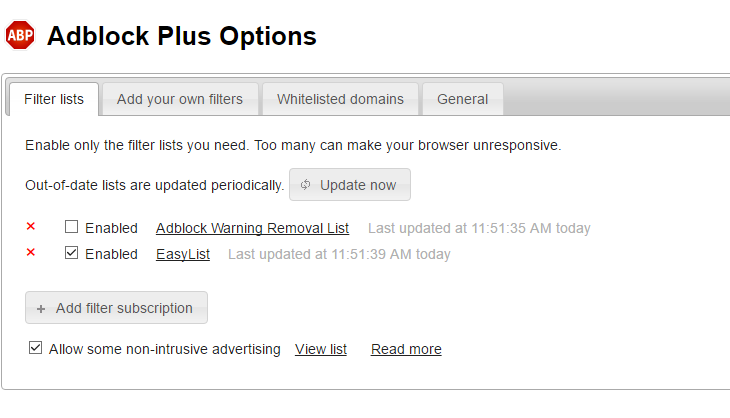 Adblock Plus is a relatively simple application with a few key additional options. You can create filter lists which allow or disallow popups from certain websites, allow for non-intrusive ads, create your own filtering syntax lists and utilize the general whitelisting feature. It failed the PopupTest.com samples, passed the good popup samples from the site, and passed the animefushigi test with flying colors. Animefushigi, in particular, was quick to transfer me to their angry adblocking page. ABP also allowed Bungie.net to spawn its login popup, a good sign as well. With its effective blocking and additional features, ABP is definitely a great option for those looking to disable on-page ads, but who don’t need a lot of additional features to curate the experience. Adfender has a large number of options available. Coming with a trial version, it advertises itself as being able to block pretty much everything, from popups to tracker cookies to ads on Youtube. Expectedly, it did not block any of the popups from PopupTest.com, while allowing the good popup samples to load. AdFender excelled at blocking all of the ads on animefushigi, prompting a redirect to the anti-ad blocking page rather quickly. 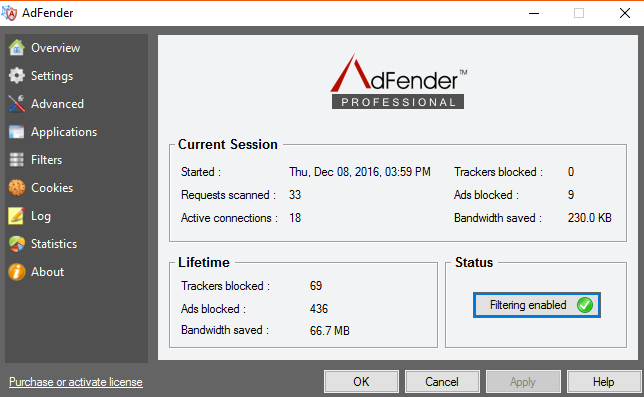 AdFender’s metrics, accessed from the system tray, show a large number of ads blocked from the site. This application also allowed Bungie.net to load its login popup with no slowdown in loading at all. In all, AdFender is one of the most customizable on the list. You can adjust the listening port, apply proxy settings, set HTTPS filtering options, browse anonymously through Tor, block tracking cookies, and block ads on different applications beyond web browsers, and view your blocking statistics. Note that most of these features are only available on the full version. The free version only includes the advanced popup blocking. Smart Popup Blocker is one blocker you’ll simply want to avoid. Not only did it fail the PopupTest.com samples, but it also failed to block any popups or on-page ads from animefushigi. It allowed the good popups from PopupTest and Bungie.net. Given it’s designed to work with Internet Explorer, that’s where it was tested, to no avail. Smart Popup Blocker can be accessed from your system tray. Should you find that it does actually work, Smart Popup Blocker also includes whitelisting and cookie management so you can delete unwanted tracking cookies. There are also few useful features to speak of on this application, outside of a cookie manager, whitelist, sound notifications, and popup blocking for Windows Messenger (not necessary for almost anyone). Ad Muncher has a large number of customization options. 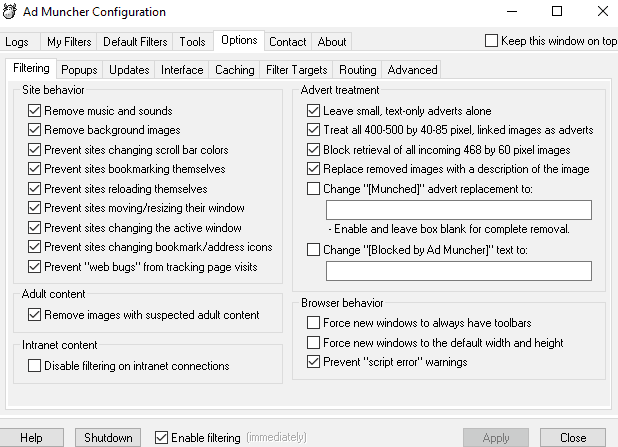 There are settings for altering site behavior, such as removing music, background images, automatic reloads, and self-bookmarking, prevention of tracker cookies, very detailed advertisement blocking options, preset and customizable filter settings, image removal for adult content, disabling for intranet connections, some browser behavior settings, the option to change the block message to anything you want, and detailed, searchable logs. Ad Muncher operated much like the other third-party applications. It failed the PopupTest.com sample tests and allowed the good ads from that test to pass through. It also allowed the good login popup from Bungie.net. While it blocked the two popups from animefushigi, it failed to block any of the on-page advertisements. Although it failed to block the on-page ads, Ad Muncher still made a good showing. For those that like to read logs, this is one application to download. The logs are incredibly detailed and searchable. For this one, you’ll likely want to ignore the hit it took from the PopupTest.com samples. As a straight popup blocker for real ads, it’s top notch. For on-page ads, however, you might want to look elsewhere. uBlock is very effective at blocking ads. The biggest drawback for this extension is that it has only limited customization features. It allows you to hide block placeholders, shows a limited amount of log data, has personal and 3rd party filtering, allows whitelisting, and allows for dynamic filter rules. However, you can’t adjust the strength of the filter. uBlock failed the PopupTest.com samples as expected while allowing the good samples from the test. It also passed the good login popup test from Bungie.net. It blocked all of the popups and on-page ads on animefushigi, triggering the ad-blocking page redirect. As an extension, this is a great option for those that don’t want to download any programs to their computer. It uses very little memory, making it a good, efficient option for those that want easy, free ad blocking. 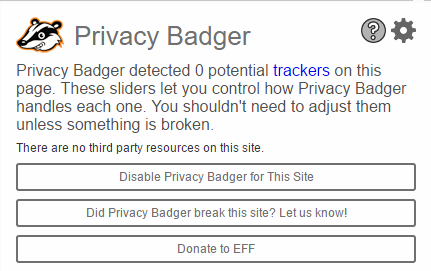 A free, specialized blocker from the Electronic Frontier Foundation, Privacy Badger is a bit harder to rate amongst the rest of the built-ins and third-party blockers. In EFF’s own words, Privacy Badger “focuses on disallowing any visible or invisible „third party“ scripts or images that appear to be tracking you even though you specifically denied consent by sending a Do Not Track header. It just so happens that most (but not all) of these third party trackers are advertisements. When you see an ad, the ad sees you and can track you. Privacy Badger is here to stop that.” This means that if you see an ad blocked by Privacy Badger, it’s a tracker. As such, Privacy Badger does not block many of the same ads the others do. As expected, Privacy Badger has very few additional options. You can set filter settings, whitelist websites, prevent WebRTC from leaking your IP address, replace social widgets, and show blocked ad counts. Privacy Badger met expectations with the PopupTest.com samples (failed the bad popup tests, passed the good ones). It didn’t block any of the ads on the animefushigi page, including the popups. We can only assume that this means there were no tracking ads on the page. The only hitch in Privacy Badger was that it did block the image from loading on the Bungie.net login popup. This didn’t prevent a login, however.